Corporations are putting profit ahead of consumer health! Food, Inc. lifts the veil on our nation’s food industry, exposing how our nation’s food supply is now controlled by a handful of corporations that often put profit ahead of consumer health, the livelihood of the American farmer, the safety of workers and our own environment. Food, Inc. reveals surprising and often shocking truths about what we eat, how it’s produced and who we have become as a nation.For most Americans, the ideal meal is fast, cheap, and tasty. 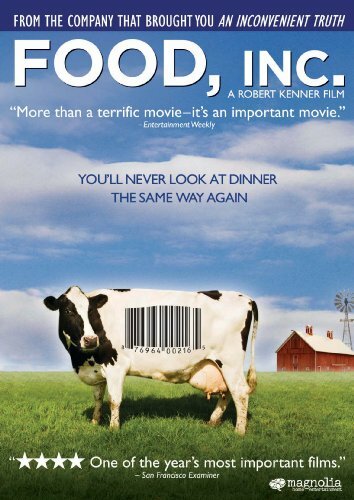 Food, Inc. examines the costs of putting value and convenience over nutrition and environmental impact. Director Robert Kenner explores the subject from all angles, talking to authors, advocates, farmers, and CEOs, like co-producer Eric Schlosser (Fast Food Nation), Michael Pollan (The Omnivore’s Dilemma), Gary Hirschberg (Stonyfield Farms), and Barbara Kowalcyk, who’s been lobbying for more rigorous standards since E. coli claimed the life of her two-year-old son. The filmmaker takes his camera into slaughterhouses and factory farms where chickens grow too fast to walk properly, cows eat feed pumped with toxic chemicals, and illegal immigrants risk life and limb to bring these products to market at an affordable cost.